The wet season in Burma is when dengue fever strikes communities. The Karen State public health department has diagnosed 436 people dengue fever as of July 14, 2018. Among the recorded 436 cases, 306 were from Hpa-an, 35 from Kawkareik, 39 from Hlaingbwe, 20 from Myawady, 8 from Kyainseikkyi, 22 from Hpapun and 6 from Thandaung Townships. Doctor Tun Min the head of the State Public Health department said. Dr. Tun Min said that the fever is common among children from 5 to 9 years old and there not been any deaths so far this year. The health department has been organizing and going around town every week to give larva repellant and using mosquito repellent (gas) to kill mosquitos, and heath education courses are given to each section and wards. 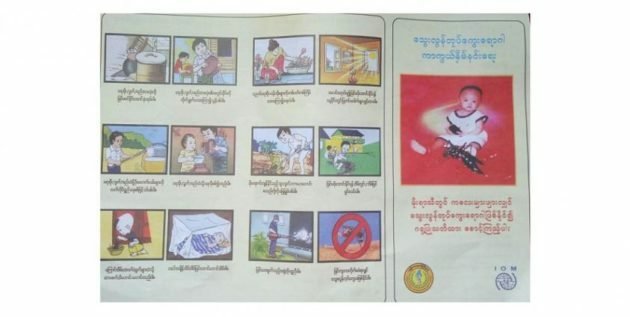 The Health Department warned that the children under 15-years-old who have high fever, rash, dark vomit (coffee color), low blood pressure need to seek urgent treatment at their nearest clinic or hospital. Dr. Tun Min said that health worker alone cannot fight dengue and he urged public participation. According to statistics from health department nationwide, dengue is common in populated Yangon, followed by Irrawaddy, and Tanintharyi Region.